"Fortunately. the new interface is still an experiment." I don't see the new interface, but a simple way to opt out from the experiment is to delete your Google cookie. Another option is to use a different browser or the private/incognito mode. I don't like the new interface. Hope they go back to the old one. It feels "slippery", don't know why. Maybe it lacks visual anchors. Putting space between elements doesn't necessarily make them easier to focus on. All links(visited or not) are same color.... it's ugly!!! Don't be so quick to judge, it's still an early phase in an evolving experiment. I don't like this new "Test Look" either - very hard to read - much less info. per space - looks boxy. And it looks cheaper and more like advertizing instead of content! Google is a GREAT search Engine and usually my only choice because it looks and reacts the best - this new look takes away it's better looks and knocked it down a bit towards the lesser search engines in my book. Please Google go back - you had it right before! I like the new design, maybe a bit to much white space an may be the colors. But this a company that text 30 off color blue to derive at the right color I would not be surprise if many people are seeing very slightly different versions in different areas. Not a fan of the extra space -- makes it look like something is missing. As usual, none of the comments show any sign of actual knowledge about typesetting and typography--- yet all sling about terms like whitespace with abandon. Typical. It's awful, simply don't like it. I much rather prefer a big laundry list of information of the sites rather than hardly any. I dislike the new interface. i don't like it, too hard to read. Don't fix what isn't broke!!! And it would be nice if they warned us first regarding a test. I did a system restore because I thought something was amiss with my computer. I really hate it. Usually I like the changes (eg. new homepage, new chrome logo, etc) but I really think this one is just plain ugly. I'm glad I don't have to try it. Poor HSM. Better than everyone else because of his typesetting knowledge. Yet, not bright enough to tell the difference between two out of twelve people writing whitespace and all. Or to expound with some lofty but informed observations. Typical. I really like it. It's simple and it highlights the title and the description of the page. The space between the results it's maybe a little to wide but I guess it's better for noticing the difference between the ranks. Overall it is quite nice. Hate the new look. Besides that which was said above, the new look doesn't change the colors of the previously visited sites to purple like it use to. That feature was extremely useful. I don't know if I'm just weird like that, but the new colour seems like a really poor choice. I mean, every time I search for something I am greeted with these bland characters that are just not appealing to the eyes. I hope there will be an "use the old interface forever" option. While I realize that like with all updates I will eventually get used to it (youtube comments is a good example) but why should I get used to something that is worse? Anyway, hoping for the option to keep the good old interface. Marissa Mayer needs to still be in control of search. Just took me 15 minutes to work out what was going on with my wife's laptop. I'm sure many people will think that they have some form of malware on their system. (Oh and no cache links, that's awful - sites constantly go up and down). Like people said, there is too much whitespace and the colors look very bland. Luckily switching to incognito mode reverts it back to the original Google layout. I still hope this "experiment" stops, however. I can't click "New incognito window" every single time I get online. Google is the only search engine I use. I'm used to the "feel" of before and the old Google didn't really look cluttered at all. I've seen that no underline search results page in IE9! Strangely, though, it's nowhere to be found in Chrome. I didn't know though if it was IE9 removing the underlines, there's an option for that, or if it was Google. I don't remember seeing dotted lines, but thought it looked "different", not knowing if I liked it or not. 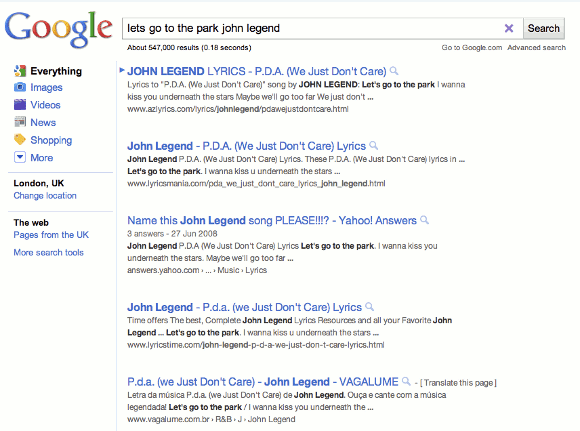 I might start using Google again if they go back to something simple and useful like this. The current cluttered page mixed with the absolutely worthless Instant garbage forced me to quit using Google for search. Classic. So much negativity. 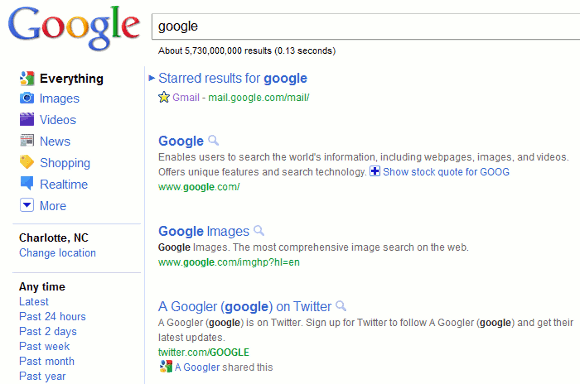 Remember much we all hated the 'new' Google images interface? And oh my god when they made it two clicks to log out. I like this new look and ever goes past the fourth result anyway? I dont like it at all..!!!! Don't like it. The color scheme looks like spam ad links. Maybe that's the color scheme used for google ads. Wasted space. bring the good old interface back!! You're right, it looks like spam links, which bothers me because I've trained my peripheral vision to immediately ignore that style and shading of font. This is gonna take me a while to retrain my brain around, and it has more important things to do. Hate it. All I want is a search box which leads to a list of results. Period. I don't want crap at the top or down the side offering me more options. I feel those things should be items those who want them can turn on, not ones I'm forced to deal with and have to struggle to turn off. I do not like it either, and definitely preferred to original look. Why do all the websites have to experiment with their look ... usually to the worse? Whatever is this new design, as of now, I am disgusted by the "vomit" color scheme of things in here. WHAT IS IT? WHY DOES IT LOOK LIKE Max OsX or Windows7 app? When I will WANT this Linux/OsX/Win7 aero look, I will choose so in the system, I just want my plain text look as before. I DO NOT want to look at the new, ugly screen, please! Why do you add insult of this screen setting to injury made by Intel and Microsoft in form of 1024x600 screens? Do you know how bad is that? It's total.... color diarrhea... the light gray inverses color with the white inder just any angle, you can not find a look where it does look any decent. What are the top stripes anyway other than ugly? Totally disruptive. Enough to stop using the site - for me. Does Google read this? I hope so. Please restore the feature that changed the color of previously read pages to purple. I find I am unintentionally revisiting sites that are not useful because there is no way to distinguish them, unless I write them down, not an option. People do not search from top to bottom so we need to have a way to distinguish visited sites from those yet to try. Thank you.